As horrible as the World War II was, that was really a turning point for women. 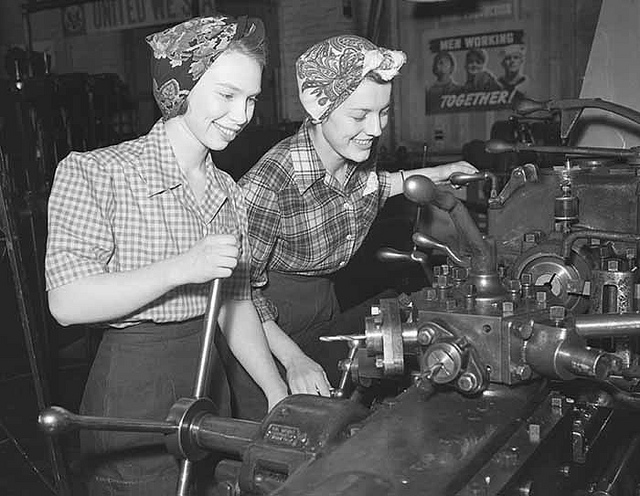 With the men off at war, women needed to step in and work the factory jobs to keep getting supplies created. Once the war ended, many women enjoyed not just working, but the sense of importance that came with it; so they fought to keep these rights. The feminist movement gained a lot of victories for women, and from there women have never looked back. Obtaining higher education, working full-time jobs; no matter what was placed in front of women, they kept on moving forward. Today a working woman’s life is quite different than even just 20 years ago. Here are some of the major differences that women in the modern era face, compared to those before them. One of the most positive changes for women living in 2014, is that the employment of women in the workplace is higher than ever. In the last 60 years employment rates for women have rose from 31% to 62%, while males employment rate has dropped from 89% to 75%. These are some very drastic numbers, which has led to quite a few changes for the working woman. While many families before could be supported with just a single parent working, nowadays most families rely heavily on a woman’s income to help support family life. Majority of working women are putting in 40 hour weeks, before they even begin to think about making dinner and spending time with their husband and children. The extra income from working is obviously needed for most families, however this has led to a few changes. Families are eating out more than ever, with the need for child care rising dramatically. Due to the time constraints of work schedules on both parents, families are now resorting to eating out more than ever. In the 1930s, when it was normal for a woman to stay at home with the kids; every meal was taken care of by the stay at home mom. When women started working 20 hour weeks and just joining the work force, meals were still being prepared by a man’s wife each night. Yet fast forward to the modern day era, when sometimes a woman puts in more hours of work each week than her husband; this is where something has to give. Parents are either stuck at work, stuck in traffic, or running around taking their children to after-school activities; so they simply do not have enough time to go home and put together a well thought out meal. The result is more families stopping at fast food restaurants on the way home each night which has lead to increased levels of obesity across the board here in the United States. Possibly the biggest change for working women is paying for premium child care while they are at work. Instead of being able to stay at home and watch the kids throughout the day, parents are forced to send their kids to child care. If you are lucky, you have a close relative (grandma, mom, dad, etc…) to watch your children as they are young. If not, you are looking at paying quite a bit to ensure your child is taken care of during the day. Working women have had to adjust to this, which is a main factor in why women are waiting longer than ever to have their first child now. Some families have actually adjusted to this by having dad stay at home with the kids, while mom goes to work. While so much has changed over the years for working women, I’m sure there will be even more milestones crossed in the near future. I could easily see the first woman president taking office within the next decade. The world will keep on progressing, and I cannot help but wonder what women 30 years from now will think of the working women of 2014. It has to be something super special for us to go out to eat as a family. Dragging 4 small children to a restaurant is not always an easy process, not to mention the price. We are happy with our weekly chinese food take-out or every so often a pizza but that’s about it. Well, we don’t get meals, instead we get the unlimited soup salad and breadsticks for my husband and I, and we get one child’s meal of chicken fingers and fries for the kids to split. Believe it or not, it is PLENTY. Another tip is to bring your own drinks for the kids – juice boxes work well. It was my husband’s birthday last weekend and we took him to Olive Garden and we ate till we were stuffed. 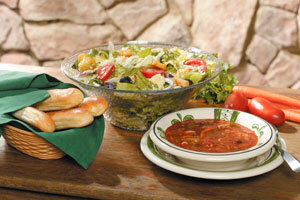 The soup, salad, and breadsticks were awesome! And you can keep getting more because it is unlimited. The kids share with us and they wind up being stuffed too. And I was so proud of my kiddies. They were so well behaved. They played with their crayons and colored while we waited to be served – which doesn’t take long at all because the only thing that needs to be cooked is the chicken fingers and fries. But by the time we are waiting for that, my kids fill up on salad and breadsticks. They sat so nicely, they were quiet. This mama was in her glory! The soup worked out great too because I cut up the little dumplings and chicken and fed it to the baby – he loved it! And the best part about eating out is that I don’t have to clean up! Yay! One thing that makes me nervous though about our “eating out on a budget” is the fact that some waiters / waitresses look down on us because we are not getting the usual meals and spending a lot. I think they think they are getting a bad tip. But I try to tell them ahead of time that we will still tip well. So, that is how we do it. We do our best to save money, but we know that it is also nice to treat ourselves every once in a while. And it is possible to feed a large family with just a little bit of money. How about you? Do you splurge and go out to eat with your family? Are you on a budget? Do you have ideas that you can share? Please comment! I grew up in a home that had a consistent daily family meal time. My mom usually had dinner ready by 5:00pm and we were always required to come home for dinner no matter where we were at the time. And we did not just grab our food and eat separately somewhere in the house – we all sat down together to have our dinner. Sometimes it was annoying, especially when I wanted to be out playing with my friends. But looking back, I can see how important it was. That was the time when we talked about our day and we had no choice but to listen to eachother and bond as a family. It was only my brother and I along with my mom and dad. But I feel that no matter how big or small a family is, it is important to set aside time together – and what better time than at dinner? I do understand that some families have busy schedules. Spouses may work late, kids may have sports. But if there are days when everyone is going to be home, then you can always work having a family meal time into the schedule. 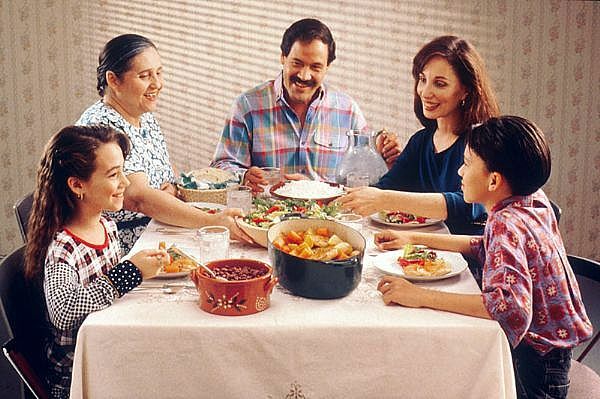 Do you have a family meal time? Or do you find it difficult with your family’s schedule? I would love to hear your thoughts!